Its that time of year again!!!!! 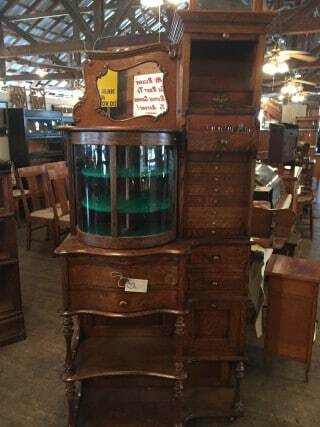 !… Antique Weekend in Round Top, Texas….. Hundreds of thousands of people descend on this rural community that is transformed twice a year into a Collectors Paradise. This is held in the spring and fall every year, rain or shine. From Austin it is about an hour drive to Carmine ,Texas on Hwy 290. From there take SH 237 to Round Top/Warrenton. There are 7 heavenly miles of non-stop tents with many unique vendors. The show sites are also on many other roads in the area extending to Fayetteville and Shelby. My favorite is Warrenton. It has miles of goody-loaded tents to browse through. I have spent 2 full days there and have not even begun to see it all. 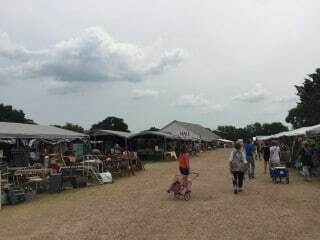 Whether your looking for restored antiques, stained glass windows reclaimed from Texas churches, Custom made furniture, Clothing, Chabby Chic décor, Furniture made with some interesting reclaimed items, or just love browsing flea markets like I do , then this is the place to be! People watching is always entertaining and they have food vendors that are unbelieveable! During my wandering I came across several dental items that I took some pictures of to share on our 12 Oaks Dental blog. Anything dental interests me and although I am not sure how old these items were exactly , they are from many decades ago. I asked what was kept in the glass area but the vendor was not fully knowledgeable of the exact use of it. But it was a very beautiful cabinet. 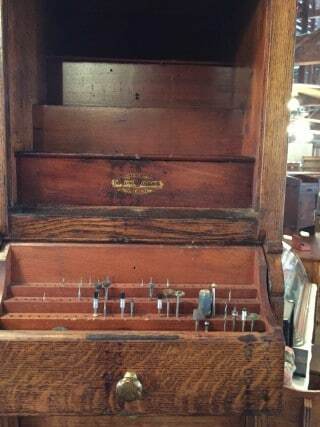 The Dental Cab had dental instruments in it from long ago. Obviously a dentist could travel with it to treats patients making dental care more available to people whether it be in rural areas or home bound patients needing treatment. 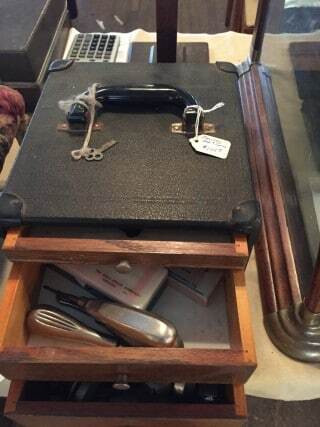 A vendor that was out there told me that it would take at least 2 weeks to view it all. A collectors paradise for sure. The next show dates are Monday March 28-April 2, 2016 and then again September 26-October 1, 2016 so start planning your trip to Round Top! The feeling of a jaw that won’t close or open and seems as if it’s stuck is one of the worst feelings someone can experience. It’s terrifying, it’s painful, and it’s random. But what exactly causes it? The team at our Austin dental office is here to hopefully ease your worries and explain what may be to blame. Before we dive into the specifics of what may be causing your jaw to feel locked in position, we’d like to clear up some terminology. The term lockjaw isn’t the same thing as jaw lock, although often used interchangeably. Lockjaw is a result of tetanus — a very serious, potentially fatal bacterial infection usually caused by a cut from a rusty piece of metal. Jaw lock, however, is what we’re talking about here and is directly related to the temporomandibular joint, also referred to as the TMJ. Now that we know the difference between lockjaw and jaw lock, let’s look into two possible explanations behind the latter. The Bite. The bite is the term dentists use to describe how the top teeth and bottom teeth fit together. If the bite is bad, known as malocclusion, or shifts away from its normal position, the muscles in the jaw, neck, and face can become inflamed. When this happens, the muscles tighten and can no longer function smoothly and effectively. It’s this tightening that makes the jaw lock up. The Jaw. The anatomy of the jaw itself may the reason behind the locking sensation. This joint has a piece of cartilage that separates the jaw bone and the rest of the skull. If this cartilage becomes damaged, usually from grinding, clenching, or an injury, it can slip out of place, causing the jaw to become stuck in place. Don’t have a dentist but experiencing jaw lock? We welcome you to call our Austin dental office to schedule an appointment. We’ll evaluate your jaw joint and talk with you about the symptoms you’re having so we’re able to diagnose what’s happening and recommend the best treatment for you. Accepting patients from Austin, Westlake, Cedar Park. Oral health is an important part of maintaining an overall healthy body. At our Austin dental office, we want to make sure all of our patients and neighbors know the ins and outs of getting their mouths optimally clean so they’re sure to reap all the benefits of good oral hygiene. Toothbrush – Besides picking your favorite color or one that coordinates with your bathroom decor, choose a toothbrush that has a medium-sized, soft-bristled head to ensure comfort and avoid damage. When the bristles start to fray, or following a bout of illness, trade in your trusty toothbrush for a new one. Toothpaste – Select a toothpaste that fits your specific needs. Suffer from sensitivity? Search for a formula that has desensitizing ingredients. Looking for other protection? There are numerous options to help a variety of issues like bad breath or weakened enamel. Whatever your needs, find the boxes with the American Dental Association (ADA) seal. Floss – Again, there are different types of floss for different types of teeth. Those with tight teeth should use waxed floss for easy gliding while those with teeth that are a bit farther apart can use regular floss. Hate flossing all together? Try a floss pick for easier use. Brushing and flossing seem incredibly easy, and they are, but that also means it’s easy to not pay attention while doing them. Make sure your teeth are getting the attention they deserve by brushing twice a day, everyday, in small, circular motions. Hit all sides of the teeth and brush for at least two minutes every time. When it comes to flossing, it’s crucial to do it everyday and get in between each tooth and up under the gum line. Regular visits to your dentist in Austin at least two times a year help make sure no problems are lurking in your mouth, and if they are, they’re caught and treated early. These visits can catch cavities developing, early signs of oral cancer, or gum disease. They’re also a great time to talk with your dentist about any cosmetic dentistry or restorative dentistry you may be interested in like tooth whitening, dental implants, or cosmetic bonding. If your at-home oral health routine is on point — you’re using the right toothbrush and toothpaste and you remember to floss — but you’re missing your bi-annual visits with your dentist, your mouth isn’t in its best, healthiest state. Take your mouth to its ultimate stage of health by scheduling an appointment at our Austin dental office today. Accepting new patients from Austin, Westlake, Cedar Park and beyond.